​​There is no right or wrong way to learn, it is only the desire to do so that matters! At our studios you will be able to work with professional performers whose experience goes beyond the stage. Chelsea and Aaron have been teaching and performing music together for over ten years, but beyond that they have been artists for their entire lives! Chelsea grew up in Edmond, Oklahoma and has been learning dance since she could walk! She has been a teacher at A.R.T.S. dance academy since her teenage years, and has much experience working with young learners. She began playing piano at a young age with the desire to move to harp as soon as she was ready! Having taken music lessons almost all of her life, she knows the experience of playing the harp from the perspective of the student, but also understands the difficulties the instrumet may bring to the parents! Playing the harp is a commitment, but there are ways of introducing oneself to music and the instrument and Chelsea can help both young students and adults with their individual musical needs! Aaron began studying piano at an early age, and has had a talent for hearing and understanding music all his life. He began playing viola at the age of eleven and studied through his bachelor's degree. He had played violin some during that time, but finally took to studying it seriously in preparation for his master's degree at Oklahoma City University. Aaron has worked with students young and old, and caters to the needs of the student whether trying to schedule in practice time around high school tests, or working a full time job and managing life! If you've ever wanted to learn to play the violin or viola, or are just seeking to advance your craft, there is never a better time than now. 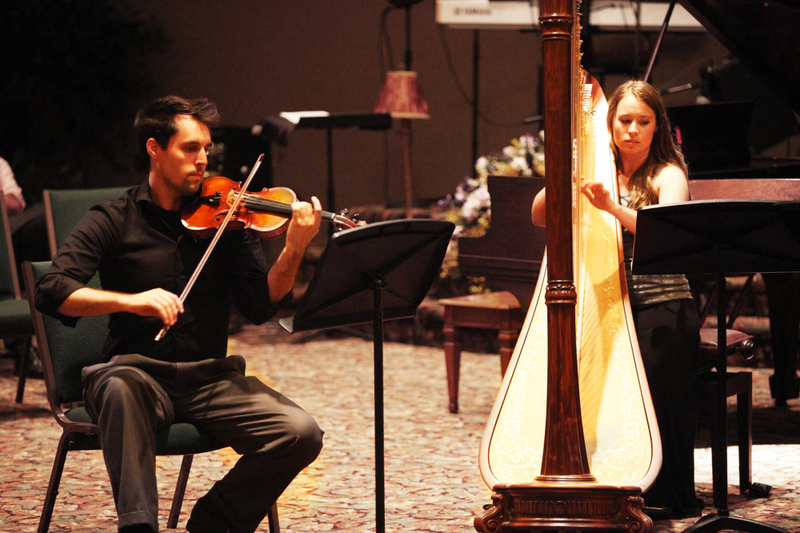 ​​Duo Romantique is Oklahoma City's most unique harp and violin duo! Chelsea and Aaron Bushong have been performing together for over 12 years and bring to you the sweet and romantic sounds of the perfect combination of instruments. We perform weddings, private parties, social events, and other special occasians. A demo of our performance style will be available soon. Please feel free to call or contact us about your event, or to schedule a consultation and live demonstration.